In order to grasp the nature of consciousness, the scope of exploration needs to include our experience of everyday reality and the material realm, as well as the realm of the unconscious and the dynamic forces that are hidden from—yet fundamental to—consciousness. This essay explores various theories that explain the dynamics between the “outer” world, the “inner” realm and consciousness. This exploration may serve to better understand ourselves and the influences that affect our perception and behaviour. Carl Jung, from a psychoanalytical starting point, and Wolfgang Pauli, from a background in quantum physics, demonstrated the ways in which these seemingly distinct paradigms in fact frame a spectrum of various models of the nature of reality and our understanding of consciousness (Main, 2014). It is unfortunate that the term “unconscious” is likely to denote a less significant or unknowable form of consciousness. Whilst the contents of the unconscious may not be known directly, they may be revealed through analysing their effects on consciousness. The interpretation of reality is fundamentally influenced by schemas which are often part of the hermeneutic unconscious—the unconscious that allows for interpretation, giving meaning to our experiences and supporting self-reflection and understanding (Woody & Phillips, 1995). The potentially therapeutic process of bringing these unconscious influences to conscious awareness allows them to be understood and modified, changing our perception of reality. For example, an individual experiencing self-sabotage often undermines their own development and fails to implement strategies that could support their healing. By exploring their patterns of behaviour, they may realize certain related unconscious schemas, including self-doubt, a sense of worthlessness and a fundamental distrust of others. These schemas can then consciously be modified in order to change the individual’s belief system, replacing their self-sabotaging behaviour with self-healing. When addressing the relationship between mind and matter, it is pertinent to consider that according to quantum physics, physical entities are more similar to the mind than they are to matter (Stapp, 2009). The unconscious mind conducts complex mental processes that are not usually available for conscious consideration, and provides images and thoughts to the conscious mind, which then perceives what is considered everyday reality (Oschman & Pressman, 2014). Whilst psychological barriers separate consciousness and the unconscious (Oschman & Pressman, 2014), it is important to realize that these barriers are fluid and dependent on our level of self-awareness and on the ability to recognize the impact of the unconscious in our conscious experiences. That the unconscious can affect the material realm is significantly demonstrated by conversion disorders (Freud, cited in Oschman & Pressman, 2014), in which repressed information manifests as physical symptoms, which in turn may bring this information into consciousness. Examples of conversion disorders may include suppressed anger that is stored in the unconscious mind, manifesting in the physical body as tight hamstrings or unaddressed psychological trauma manifesting as stuttering. According to Jung, the collective unconscious gives rise to the personal unconscious and consciousness (Frentz, 2011). The collective unconscious is comprised of information that was never conscious and owes its existence to heredity (Ko, 2011). The personal unconscious contains the adaptive unconscious, which processes vast amounts of information necessary for daily functioning, as well as information that was once part of the person’s conscious and has since been forgotten or repressed (Oschman & Pressman, 2014; Frentz, 2011). Jung regarded the contents of personal consciousness as limited in comparison to that of the collective unconscious (Ko, 2011). Whyte (1962) agrees that the unconscious is more general and inclusive. Athletes may engage with hypnosis, visualization and psychotherapy in order to perform at their optimum level whilst requiring minimal conscious effort. This peak experience is an example of conscious preparation that can trigger unconscious processing (Pressman, 1977, 1979, 1980a, 1980b). The unconscious includes archetypes—inherited instincts of the psyche which predispose individuals to perceive, think, feel and act in certain ways. Archetypes are common to all humans and support individuation—the process of optimizing one’s psychological state (Frentz, 2011). The etymology of the word “archetype” is revealing: “arche” refers to that which is “primal” or “dominant”, and “type” refers to “form” (Jacobi 1959, cited in Stevens 2015, p 52). The archetypes are psychoid—to use the term coined by Jung—in that they consist of and structure both the psyche and matter (Frentz, 2011). These structuring principles, in turn, change according to information from both the psychic and material realms. The archetypes connect the collective unconscious to the individual consciousness, and the psyche connects events in the physical realm. Archetypes become evident as thoughts and images that contain emotional states (Oschman & Pressman, 2014), so that when an archetype is activated, the related emotions are experienced. These emotions influence our perceptions, and consequently, our behaviour and experiences (Hauke, 2014). Whilst the archetypes cannot be known directly, their images, which are influenced by culture and the individual who experiences them, can be experienced directly within the material realm (Frentz, 2011). The archetypal images make complex information from the unconscious realm available to consciousness. The activated archetype may illuminate the connection and ultimate unity of the psyche, or inner state, and the material realm, or outer reality. The influence of the archetypes structures all spiritual forms of religion, art and science, as well as all forms of matter (Card, 2000). 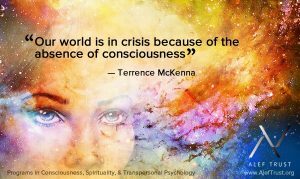 Just as the unconscious influences our conscious experience and the material realm, so our level of consciousness affects the unconscious. Pauli recognized the importance of understanding the psyche of the observer as much as that which is observed (Stevens, 2015). Wheeler (1981) acknowledges the observer-participatory nature of the universe, in which consciousness may affect both matter and psyche. Ko (2011) expands this model to include the life force movement that connects, and ultimately unifies, the mind and nature—a central concept in divination systems, such as the I Ching. Being aware of the potential influence of the unconscious on our conscious experience encourages the observation of our behaviour and the exploration of the related areas of the psyche. Consciously creating space and allowing for previously unconscious elements to move into consciousness offers the potential to develop our self-understanding, as well as an understanding of the influence of the collective unconscious in our lives. Synchronicity involves an image that was unconscious being experienced directly (as a literal event) or indirectly (as a dream, thought or idea), and a seemingly objective event reflecting the same image (Jung, 1969, cited in Frentz, 2011). Jung (1960) defined synchronicity as a “meaningful coincidence” (p. 10) or an “acausal connecting principle” (p. 5), implying that there is not a direct cause that links the two events. Perhaps there are subtle causes or causes rooted in the unconscious of which we are consequently unaware. The emotion-laden experience of synchronicity is usually accompanied by the activation of an archetype (Marlo & Kline, 1998), which may serve to fulfil an underlying need (Stevens, 2015), and which may be experienced positively or negatively. Perhaps the person in need directly triggers the occurrence of a synchronistic experience. This may be explained through a process in quantum mechanics in which the observer (in this case, the person in need) causes the event (in this case, the synchronistic experience) to manifest. This process of actualizing the properties of particles through observation is also known as the collapse of the wave function. Within the natural order of things, there may be a special order of things—the subjective process of connecting two seemingly unrelated events in order to add meaning to life. This would reveal valuable, but previously unrecognized insights, to the psyche, including needs, desires, and fears. This process may explain the unique meaning that synchronicities hold for those experiencing them—something Jung recognized when considering the value of events that do not necessarily have a causal connection, but that are connected through the meaning they hold for those experiencing them (Main, 2014). An example may be a man who, after much deliberation, decides to buy an engagement ring. Just a few minutes after his decision, he receives an e-mail notification that a jewellery store that has the perfect ring is having a sale. While his decision to buy a ring and the jewellery sale do not seem causally connected, the man may interpret these events as confirmation that he has made the right decision. Indeed, encounters with the archetypes are often described as numinous, or having spiritual or divine qualities (Hauke, 2014). Pauli recognized that the observer influences that which is observed, and that the observer is changed by their observation (in Main, 2014). This two-way transformation seems to hold weight in the argument that synchronicity seems more prevalent in the lives of those who actively seek it. This implies that the experience of reality is dependent on the intentions of the observer (Stapp, 2007). A pertinent consideration may be whether evidence of a synchronicity validates the event even if the person experiencing it does not find it meaningful. Consider the example of a woman who has a dream about her estranged father with whom she has not had contact for years. The day after the dream, whilst on a road-trip, she notices a sign saying, “Eagle’s Nest,” which is also the name of her father’s house. Later that day she receives an unexpected message from her father’s brother, whom she has not seen for years, saying that he is in town and would like to see her. She could experience these events as synchronistic, relating the dream to both the sign and the message from her uncle, causing her to explore the deeper meaning thereof. She may even recognize a previously unconscious need to reconnect with her father. Would she have noticed the road sign were it not for the dream? Was the message from her uncle motivated by the same unseen forces that created the dream? Or, were these events entirely unrelated? Does the value of synchronicity depend solely on the meaning ascribed to it by those who experience it, or is there an objective valuation simply by its occurrence? Storm’s (1999) argument that synchronicity finds validity in those for whom it is meaningful seems well-founded. It may be argued that the experience of synchronicity fulfils our innate need for cosmic specialness (Becker, 2014). However, Peat (cited in Frentz, 2011) argues that the experience of synchronicity offers insight into the implicate order—a deeper level of reality in which everything is connected and from which our everyday reality unfolds. Peat explains that information gives form to energy in order to create matter. This model invites the notion that the archetypes structure consciousness to create the material realm. Likewise, it could be speculated that matter transfers information to the unconscious in order to evolve the archetypes. Peat (n.d.) describes the notions of the inner, subjective world (including thoughts, dreams and spirituality), and the outer, objective world (including energy, matter and science). Perhaps the real, objective, consistent world is the inner one and the subjective, ever-changing, self-created world is the outer one. One’s understanding of the unconscious may be a determining factor in the view one takes. The fundamental separation of the inner and outer worlds is based on the assumption of duality and begs the question of whether synchronicity can serve as a bridge between the two worlds. Adopting a position of neutral monism, in which mind and matter are manifestations of a neutral basis and are not essentially distinct (Silberstein, 2009), allows for an explanation of synchronicity that is based on causality. Seemingly distinct events reflect a reality in which subject and object (or the individual and the world) define each other and cannot exist separately. If we considered matter as an expression of mind, and body as an expression of spirit, and consider the possibility that these relationships involve a two-way, dynamic exchange of information, then the need for a bridge would be absurd. The theory of synchronicity then becomes the exploration of the workings of a global system that transcends such distinction (Peat, n.d.). Synchronicity may be regarded as moments of insight into this fluid interplay and ultimate unity that is the fabric of the universe. Bell’s theorem (Capra, 1999) implies a holistic model of the universe in which everything, known and unknown, is indivisible. The external, material world of science and rationality would then be one and the same as the internal, imaginal world of intuition and the psyche. From this perspective, it would seem that synchronicities are not unusual or special events that signify something outside of the experience, but rather represent opportunities for awakening into the profound holism of the universe. Sheldrake’s (2014) theory of morphic fields resonates strongly with the theory of Jung’s archetypes. These higher level organizational patterns that determine the quantum potential of “reality” (Sheldrake, 2014) may be considered a field of propensity and the structuring influence of the psyche and the material realm. Whilst archetypes are limited to the human experience, morphic fields apply to the entire physical realm. These information fields of various levels exist within each other, and their influence can be top-down or bottom-up. An example may be the morphic field of a gene influencing the entire organism through genetic expression, and that of the entire organism, in turn, influencing the gene through epigenetics, the study of “how external forces, such as one’s environment and life experiences, trigger on-off mechanisms on the genetic switchboard” (Psychology Today, para. 1). The theory of morphic fields remains controversial (Shermer, 2005) and there is much disagreement about the research findings that may support it (Blackmore, 2009). According to Sheldrake, one of the reasons for this is that the beliefs of the observer affect the outcomes of the experiment (Shermer, 2005). An exploration of the unconscious and the material realm would, however, be incomplete without considering the possible explanation that morphic field theory offers for the existence of collective memory (Sheldrake, 1997). Sheldrake explains that we are most similar to previous versions of ourselves, and therefore resonate strongly with our past selves, perpetuating this resonant “essence” of self. On a collective level, we may resonate with others of similar resonance, tuning into their lived experiences and psyche, forming a collective unconscious (Sheldrake, 2013). The establishment of just such a morphic field, or family constellation (Meyburgh, 2005), may explain intrinsic memories and patterns of behaviour that are perpetuated through generations. This is an example of how information may be held in the unconscious, whilst the effects are evident and impact the material realm. This may also provide an explanation of the Hindu belief of karma (Sheldrake, 2014), which is a trace of memory that is stored in the unconscious as an impulse and which holds the potential to influence one’s actions (Coward, 2003). Since nature is all-encompassing, it follows that nature creates and embodies its own structure and habits which evolve (Stapp, 2009), supporting the theory of morphic fields. While the theory of morphic resonance is not substantially supported by scientific data, it is yet to be disproved and provides an insightful model for considering the dynamics of the unconscious, conscious experience and the material realm. Potential therapeutic benefits may include identifying and understanding patterns of thinking and behaviour, which could then be changed. By increasing one’s awareness of the fundamental dynamics of such influences, the unconscious information that sustains the field may be altered. This could explain information that is carried from one generation to the next without conscious transference, but with significant effects, including certain propensities, psychological disorders and physical diseases. Morphic fields could also explain our level of engagement with an activity or person. Common expressions such as “not being able to get into a book” or “being tuned into another person” may reflect an intuitive understanding of resonance. Morphic resonance could provide an explanation for certain dynamics in my therapy practice, including working with a child with challenging behaviour: at first, there may be resistance to therapeutic intervention, but through setting clear intentions and being fully present during the therapy session, I am able to engage with the child and resonate with them, resulting in a harmonious interaction. This echoes the Zen practice of resonating with one’s reality in order to experience harmony (Austin, 1998). While other possible explanations may exist, the widespread applicability of morphic field theory makes it a suitable basis for further exploration of the relationship between the unconscious and the material realm, and suggests that further research is due. Bohm’s theory of holomovement places primary importance on the implicate order, the realm of potentiality in which everything is enfolded. Events unfold and are actualized into the explicate order (the reality that we can experience directly) and enfold back into the implicate order (Frentz, 2011). This supports the idea of a fundamental unity of the unconscious and consciousness, the psyche and the material realm. This holistic, complete order of all things may be reflected, as a hologram, in the essence of space and time, and permeates all that arises. Mitchell and Staretz (2011) consider the quantum hologram as a system of storing and retrieving information that is based on quantum phenomena that affect both the macro and micro levels of existence. Quantum emissions from an organism, for example, would contain information about the organism as a whole. There is increasing evidence that every physical entity resonates with a unique holographic image that contains holographic memory, much like an individual may be considered resonant with certain archetypes (Mitchell & Staretz, 2011). The quantum hologram is non-local and it is possible to resonate with another entity’s quantum hologram, which would support the experience of synchronicity, as well as certain psi phenomena, like psychic healing (Mitchell & Staretz, 2011), healing prayer (Dossey, 1993), and telepathy (Sheldrake, 2017). This would provide insights into the nature of reality and the consciousness that experiences it. The theory of a quantum hologram regards information, energy, and matter as equally fundamental, and as nature’s information storage and transference system. The very idea of the quantum hologram resonates with the idea of the collective unconscious (Mitchell & Staretz, 2011) and the workings of the archetypes. Not only does this shift the emphasis in our search for meaning in life away from the material realm when considering the influences and meaning of energy and information, but this concept alters the way in which matter may be perceived. It is indeed a form of energy and information, and reflects the unconscious forms with which it resonates. An example is the traditional way in which Chinese medicinal herbs are cultivated: the area in which they are grown is carefully chosen, as the energy of the site fundamentally affects the structure and medicinal properties of the herb. Herbs grown in another area or under contrived conditions will contain different information, which will impact their effectiveness. With this holistic understanding, it is possible to experience a fundamental shift in our perception, and conception, of reality. While the theory of a quantum hologram may not reflect Pauli’s hope for a neutral terminology that addresses both physics and the archetypes, it may reflect Jung’s idea of “Unus Mundus,” a transcendent unity, as well as Pauli’s belief that this unity could be rooted in science through quantum physics (Oppenheimer, n.d.). While many of the theories addressed in this essay are scantly supported by experimental data, their value in contributing to a coherent model that deepens our understanding of the unconscious, conscious experience, and the material realm deserves acknowledgement. Limiting the realm of scientific exploration to that which finds validity in a laboratory would neglect the fundamental influences of context, relativity and the dynamic between the researcher and that which is researched. Just as Pauli experienced, science itself remains a barrier to further exploration of these theories and would do well to consider quantitative, as well as qualitative data and to expand its range of interpretive lenses to include intuition alongside intellect (in Oppenheimer, n.d.). The implications of understanding consciousness as it relates to the material realm and the unconscious necessarily affects every aspect of our lives, including wellness practices and medication options, the organization of our homes, our work environments and relationships. The practice of yoga may be regarded as a physical, mental and energetic practice, affecting both the conscious and unconscious realms. The organization of one’s home may deeply influence one’s psyche and energy levels, since the house, furniture and space are expressions of energy and information that resonate with unconscious forms. Furthermore, Whyte (1962) believes that the unconscious is a source of spiritual knowledge and inspiration. The unconscious, consciousness and the material realm may be viewed as a spectrum. Peat (1987) suggests that matter is the material realization of the archetypes. Card (2000) reiterates this by stating that mind and matter are complementary aspects of a holistic, unified reality. Therefore, Oschman and Pressman’s (2014) call for a multidisciplinary approach to advancing our understanding of both consciousness and of the unconscious is well-founded. Indeed, an understanding of consciousness without consideration for the relationship between the unconscious and the material realm would be superficial and unsatisfactory. Austin, J.H. (1998). Zen and the brain: Toward an understanding of meditation and consciousness. Cambridge, MA: Massachusetts Institute of Technology Press. Becker, E. (2014). The denial of death. Souvenir Press. Kindle Edition. Capra, F. (1999). The Tao of physics: An exploration of the parallels between modern physics and Eastern mysticism. Boston, MA: Shambhala. Card, C.R. (2000). The Emergence of Archetypes in Present-Day Science and Their Significance for a Contemporary Philosophy of Nature. In Goertzel, B., Coombs, A. and Germine, M. (Eds. ), Mind in Time. Creskill, NJ: Hampton Press. Coward, H. (2003). Hindu Views of Nature and the Environment. In Nature across cultures: Views of nature and the environment in non-Western cultures. Selin, H. (Ed.). Springer-Science and Business Media, B.V. Kindle Edition. Dossey, L. (1993). Healing words—The power of prayer and the practice of medicine. San Francisco, CA: Harper. Frentz, T. (2011). Creative Metaphors, Synchronicity, and Quantum Physics. Philosophy and Rhetoric, 44(2), pp 101-128. Hauke, C. (2014). Visible mind: Movies, modernity and the unconscious. East Sussex, England: Routledge. Jacobi, J. (1959). Complex, archetype, symbol. London, England: Routledge and Kegan Paul. Jung, C. G. (1960). Synchronicity: An acausal connecting principle. New York, NY: Bollingen. Jung, C. G. (1969). Synchronicity: An acausal connecting principle. Vol. 8 of Collected Works. Trans. R. F. C. Hull. Princeton, NJ: Princeton University Press. Ko, Y.W. (2011). Jung on Synchronicity and Yijing: A Critical Approach. UK: Cambridge Scholars Publishing. Main, R. (2014). The Cultural Significance of Synchronicity for Jung and Pauli. Journal of Analytical Psychology, 59, pp 174-180. Marlo, H. and Kline, J. (1998). Synchronicity and psychotherapy: Unconscious communication in the therapeutic relationship. Psychotherapy, 35(1), 13-22. Oschman, J. L. and Pressman, M.D., (2014). An Anatomical, Biochemical, Biophysical and Quantum Basis for the Unconscious Mind. International Journal of Transpersonal Studies, 33(1), pp 77-96. Peat, F. D. (1987). Synchronicity: The bridge between matter and mind. New York, NY: Bantam. Pressman, M. D. (1977). Mind Over Figures. Skating Magazine, 54(3). Pressman, M. D. (1979). Psychological Techniques for the Advancement of Sports Potential. In Klavora, P. and Daniel, J. (Eds. ), Coach, Athlete, and the Sport Psychologist, pp. 133-143. Toronto, Canada: University of Toronto. Pressman, M. D. (1980a). Psychological Techniques for the Advancement of Sports Potential. In Suinn, R.W. (Ed. ), Psychology in Sports: Methods and Applications, pp. 291-296. Minneapolis, MN: Burgess. Pressman, M. D. (1980b). Psychodynamic Experience in an Olympic Skating Camp. In Straub, W.F. (Ed. ), Sports psychology: An Analysis of Athlete Behavior, pp. 373-380. Ithaca, NY: Movement. Silberstein, M. (2009). Essay Review: Why Neutral Monism is Superior to Panpsychism. Mind and Matter, 7(2), pp. 239-248. Stapp, H.P. (2007). The mindful universe: Quantum mechanics and the participating observer. Heidelberg, Germany: Springer-Verlag. Stapp, H.P. (2009). Quantum Reality and Mind. Journal of Cosmology, 3, pp. 570-579. Stevens, A. (2015). Archetype revisited: An updated natural history of the self. Kindle Edition. Storm, L. (1999). Synchronicity, Causality, and Acausality. The Journal of Parapsychology, 63(3), pp 247-269. Wheeler, J.A. (1981). Beyond the Black Hole, In Some strangeness in the proportion, Woolf, H. (Ed.). Reading, PA: Addison-Wesley Publishing Co.
Whyte, L. L. (1962). The unconscious before Freud. London, England: Tavistock Publications. Woody, J. M. and Phillips, J. (1995). Freud’s “Project for a Scientific Psychology” After 100 Years: The Unconscious Mind in an Era of Cognitive Neuroscience. Philosophy, Psychiatry, and Psychology, 2(2), pp 123-134. 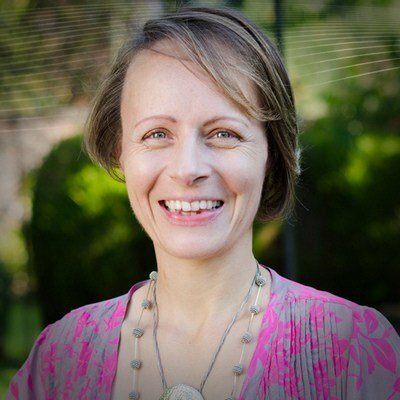 Chantal has a background in transpersonal psychology, special needs education and holistic healing. As a South African who lived in China for many years, she has a deep respect for diverse cultures and values both traditional and contemporary healing modalities. She is a qualified Vinyasa yoga instructor and certified Applied Kinesiologist, and is passionate about transformation through integral practice. She works with clients to create an individualized programme that addresses the emotional, mental, physical and spiritual dimensions through her therapy practice, which she runs online and from home in Cape Town. 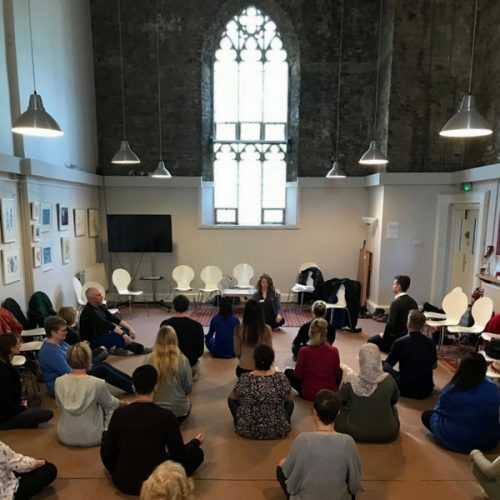 Research interests include the transformative potential of movement practices, such as yoga, Nia and spontaneous dance, factors and practices that facilitate sustained healing from a spiritual crisis, and the transpersonal nature of self-compassion. You can learn more about Chantal on her web site at https://www.chantalleroux.com, or by following the links below to her social-media profiles. On November 3, 2018, at the Beyond the Brain conference in London, UK, Chantal le Roux, MSc, MEd, virtually presented ‘The transformative potential of Nia as experienced by six advanced Nia instructors: An interpretive phenomenological analysis’ from her residence in Cape Town, South Africa. It was the research module of Alef Trust’s MSc programme in Consciousness, Spirituality and Transpersonal Psychology that inspired Chantal to choose a topic that was at once close to her heart and that could have a real impact on those engaging with and reading the results. 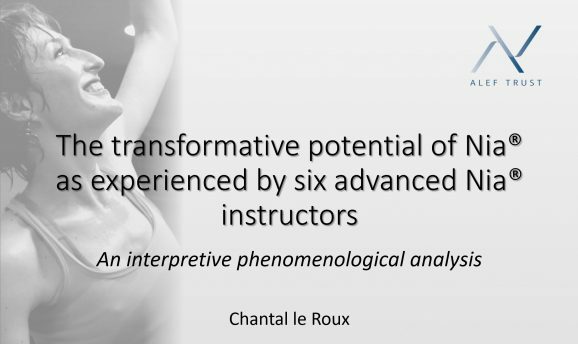 Using a transpersonal definition of transformation to explore the lived experiences of six brown or black-belt Nia instructors proved to be transformative for Chantal as a researcher, as well as the participants. 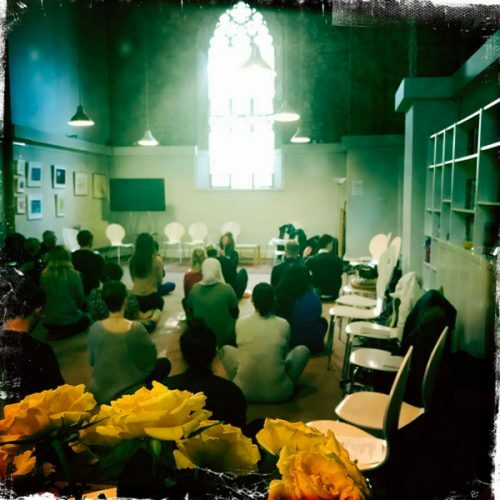 Chantal’s sister, an experienced black-belt Nia instructor in combination with the lack of research into the transformative potential of Nia at an advanced level of practice, made Chantal’s study a viable option. “Within the secret of the twenty-two letters you will find the entire creation of the world, its structure and the fullness of lifeforms … no created being can fully grasp their infinite depths. Embodying the “secrets” of each Hebrew letter in a series of movement forms is a challenge that has engaged me over several decades. The challenge is not simply to enact the letter shapes, but to use ritualized movements to convey the inner teaching of each letter. Working with these movements brings a way of knowing that goes beyond what can be achieved with words. Words strain under the burden of conveying meaning. Through the movements the body embraces that meaning and opens us into a transformative ritual space … the dance of creation. Each letter constellates a complex array of meanings which conveys the core characteristics of a specific function of consciousness. These archetypal meanings have been transmitted through the letters’ shapes, their numerical values, and the verbal roots associated with their names. When the code of its letters has been deciphered, the alphabet can be understood to relate a story. It is the narrative of creation, of humankind’s place in creation, and the quest to reflect consciousness back to the Source. The story commences with the originating Oneness devoid of any polarity, static in its nonduality. The first letter, Alef echoes the primordial contraction that disturbed that oneness, bringing potential into existence. 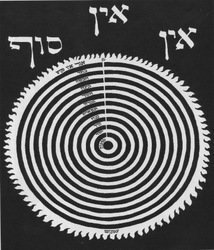 Alef is the silence behind all that is, yet paradoxically strikes a preliminary dynamic balance to seed the outward arc of creation. A verbal form deriving from its name means to ‘teach’, intimating that the teaching is entwined with this seed of creation. Alef depicts the breath that brings all into being. As we move with the Alef it takes us on a journey. First, finding a space in which we can be still, emptying ourselves of the things that bind us. We connect our breath to the divine name Ehyeh that depicts the unfolding of being – the process of becoming, the heart connecting above and below. The Alef movement proceeds to explore energy flows—the primordial, chthonic energy associated with the earth, and how the quality of the energy transforms as we reach upwards. Eventually, the movement stabilizes into a posture of dynamic potential, one hand cupped beneath the heart to receive and the other stretching upwards towards an unknown Source. 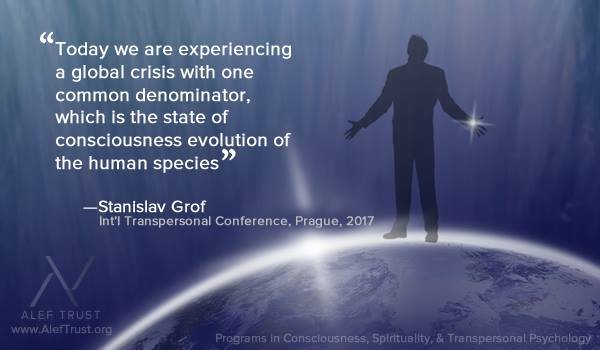 The Association for Transpersonal Psychology (ATP, a division of the Transpersonal Institute) will be celebrating the Golden (50th) Anniversary of the transpersonal field between April 12-14, 2019, with an International Transpersonal Conference at Asilomar Conference Grounds near San Francisco, California. As a professional field, transpersonal psychology was established in 1969, when ATP was granted non-profit status and published the first issue of The Journal of Transpersonal Psychology. A two-day workshop entitled “Kabbalah: Language, Movement and Ritual,” follows the ATP conference celebrating 50 years of transpersonal psychology. Les Lancaster and Jessica Bockler will teach the movements and initiate participants into the dance of creation ritual. The workshop, runs April 15-16, 2019 at Asilomar Conference Grounds, Pacific Grove, CA. A two-day workshop entitled “Kabbalah: Language, movement and ritual,” follows the ATP conference celebrating 50 years of transpersonal psychology (as below). Les Lancaster and Jessica Bockler will teach the movements and initiate participants into the dance of creation ritual. The workshop, runs April 15-16, 2019 at Asilomar Conference Grounds, Pacific Grove, CA. Join Dr Jessica Bockler and Jevon Dangeli (Alef Alumni) for the Transpersonal Coaching Virtual Open House at Alef Trust. 2 sessions are available – join either on 15th January 2019: 10:00 – 11:00 or 20:00 – 21:00 GMT (UTC). We will be discussing the value of transpersonal and spiritual perspectives in professional coaching. We will also tell you more about our 1-year certificate programme in Transpersonal Coaching Psychology. You might be interested to know how the transpersonal coaching approach is suited to help people (individually and collectively) face the challenges of our time mindfully, resourcefully and purposefully. Register for The January 15th Virtual Open House! Transpersonal coaching is the specialised practice of coaching that takes a holistic and integrative approach to supporting client growth and potential transformation. This is achieved through an individually tailored process, which is person-centred, and which may, for example, involve helping the client to identify what provides them with a sense of meaning and purpose. The focus may then revolve around supporting the client to find ways of purposefully expressing this in their work, their personal life and within relationships. 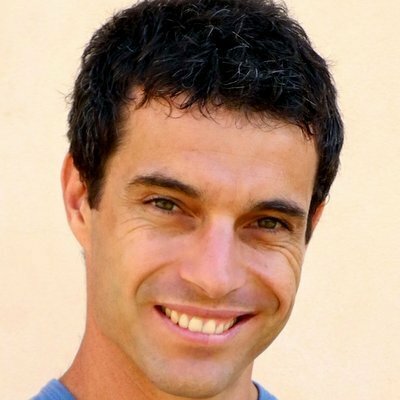 Transpersonal coaching draws on the transcendent quality of consciousness to shift the client from ego-centred focus on problems towards expansive awareness, which may enable the discovery of solutions, drawing on spiritual wisdom and principles, and doing so in a pragmatic way that aims to empower people in the contexts of their everyday lives. Transpersonal coaching can be considered as a bio-psycho-socio-spiritual approach to coaching that may help clients resolve issues concerning the body, mind, relationships and spirituality. To join us on February 15th for our Transpersonal Coaching Virtual Open House, please use our contact page or click on the Register button above and let us know which session you would like to register for. Don’t forget the time listed is in Greenwich Mean Time (GMT) so if you are unsure of the time relative to your location, try this conversion page to determine the right time for you. 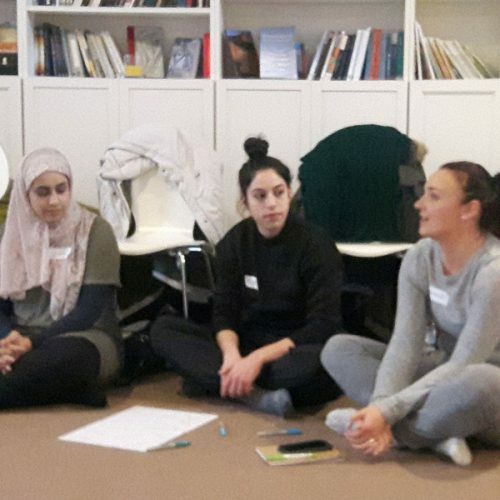 On the 2nd November a group of thirty Alef Trust students, alumni and faculty including directors Les Lancaster and Jessica Bockler transmuted from the digital realm of our online community to meet in London for a workshop day. Participants travelled from Oman, the United Arab Emirates, USA, Italy, the Netherlands, Norway, Romania, Switzerland, Malta, Spain and the UK to attend. 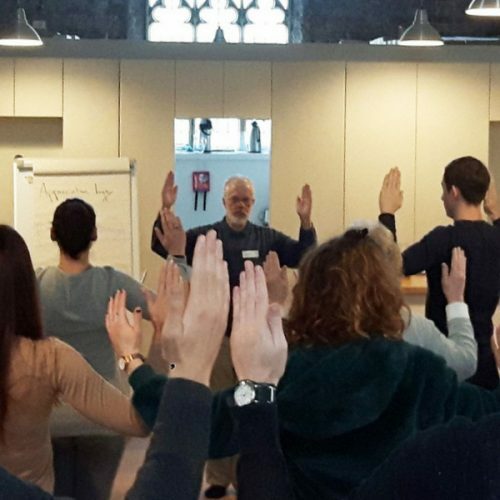 This encounter answered more than the lingering questions such as what everyone looks like without a headset, engaging emotion, mind and body for a day of enriching dialogues, activities, deep connections and – yes – fun! As Les remarked in his opening words, “When you’re present together there’s something extra.” And yet, this was a presence that went beyond those gathered to somehow include everyone who was not able to be here, as well as the leaves which dappled with the sun casting shadows onto the carpet trod by countless feet before ours. Appreciative Inquiry is used in communities as an approach to organisational change and is informed by five principles. The first and foremost is the constructionist principle which states that we co-construct the systems we inhabit through our interactions and language. Our words create worlds, and new possibilities for action and thought emerge from our relationships. The simultaneity principle draws attention to the process of inquiry itself and the way questions are asked as a catalyst for change, and the poetic, anticipatory and positive principles also contribute towards inspiring action and positive change by turning the focus away from the problem and towards what is already working and how we can enhance this. The first activity contributed to our co-created inquiry was a short yoga session with Laura. We relaxed into our new surroundings, stretching and exploring postures accompanied by our conscious breath. Jessica continued with some vocal and body warm-ups as we tuned in to notice what needed moving, massaging… noticing how the breath is released and playing with the voice to get ready for day. “Setting intentions, now there’s a challenge,” continued Les, sharing that if there’s one thing he believes it’s that everything has an outer and an inner aspect. He gestured towards a handmade oil lamp on a low table. “When I light the lamp that’s what’s in my heart and my being. To connect at all levels. 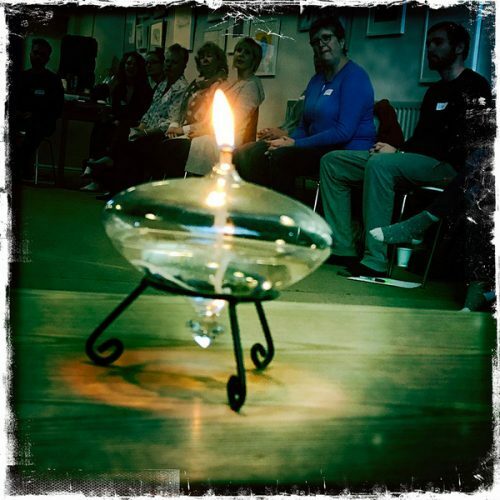 Connecting with what is in this space and what is beyond at a deeper level.” We stood in a silent circle as Les stepped forward to light the lamp, sensing our personal and collective intentions resonating around the room. 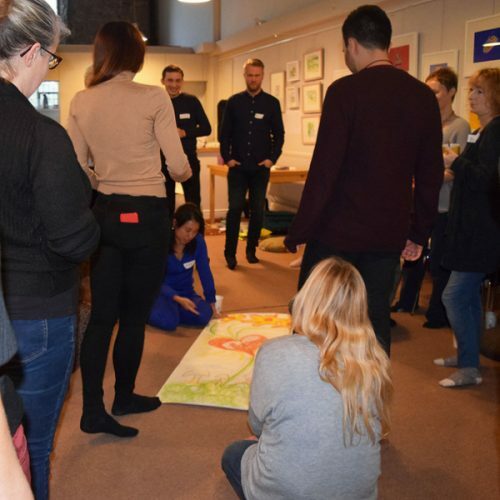 Shifting into the second stage of the inquiry and dividing into small groups, we discussed our experiences of embracing transpersonal practices which we felt had somehow contributed to a community or organisation we’ve worked with. Feedback which flowed back into the larger group included the Noble Middle Way of “both and”, accepting seemingly contradictory paths and integration, the importance of respecting difference when navigating the connection between self and other, and accepting things we don’t know. The question of what nourishes us as a community around the world, as well as the Alef community, was then explored by interweaving suggestions and practices. We lay with our heads aligned towards seven Tibetan singing bowls as Jules explained that each bowl correlates with a different chakra and with the planets. Each sound is an expression of the collective sound of “aum”, like the chakras are expressions of our collective oneness. 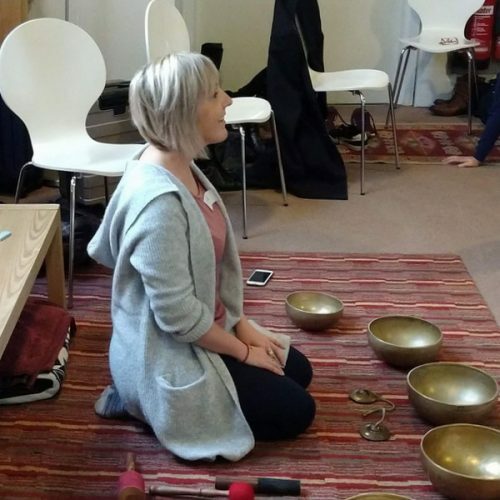 We surrendered to her invitation to bring the intention of connection and community back into our body, and let the sounds carry us to where we need to go, releasing mental activity and noticing how the sounds feel in the body and where they take us. “My intention is to create a positive healing space for everyone,” she affirmed. The frequencies lifted us on a subtle inner journey which continued to shine in our eyes as we stood up for the next activity. A delicious vegetarian buffet lunch arrived, and we enjoyed the opportunity to continue chatting and getting to know each other. 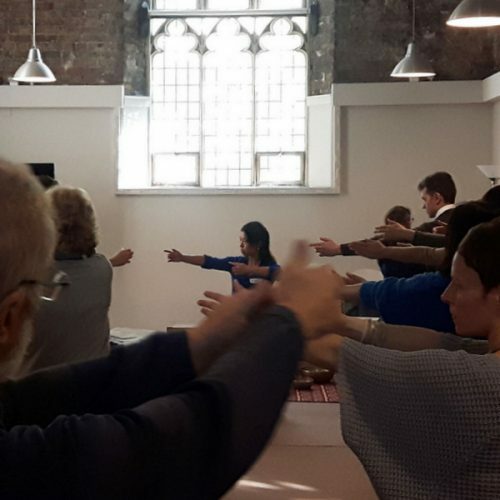 What better way to prepare for the third stage of dreaming and envisioning than some gentle Qi Gong exercises with the experienced martial arts student Rong? She guided us to sense the energy from the dantien as we held certain postures. “If anyone asks, you can all now say that you know some kung fu,” she optimistically encouraged. David then led a guided group meditation to encounter and converse with our Higher Self. Eyes closed, hearts open, he described a tranquil beach where we went within to encounter and integrate our shadow. He later shared that although any location can be chosen, a beach is especially powerful as it includes all the elements –water, sunshine, breeze and sand reflecting the integral essence of the transpersonal. Returning to the question of intentions we considered the transpersonal approaches and practices discussed in the morning. Where do we want to go from here and what do we want to create? How can we contribute to positive change? Themes were suggested, clarified, written on large pieces of paper and placed around the room. After eight themes had emerged we wandered around them, contemplating our resonances and constellating in small envisioning pods around the one that spoke to us most deeply. Les commented on how much has already changed since the course began about 25 years ago. Other student reflections included that “coming together as a group was nourishing and re-energising.” “Indeed, it’s very difficult to do anything on your own.” “The unfolding of the day was so organic and beautiful; new ideas were born into existence, smiles and laughs were shared, and most importantly, an awareness of our intention to actively grow the field of transpersonal psychology was carried throughout the day.” “It was really refreshing to be able to share this; I can’t talk like this with the people around me.” “Great conversations, I’ve learned a lot.” There was a thoughtful pause. “The thing about the heart is that it wants to be on the outside. It wants to grow and expand. It wants to sing,” said Les, drawing the session to a close. He guided a vocal practice based on three sounds. One comes from the heart and chest region, another from the lower belly, and a third from the head. We joined voices, listening to each other, beginning in silence, letting our song soar and finishing in silence. The final reflection was sung together as we looked into each others’ eyes and spread around the room: “Remember we are walking on sacred ground”. We stood in a silent circle as Jessica stepped forward to extinguish the lamp, recalling our personal and collective intentions as we prepared to go back out into the world. Transpersonal psychology is celebrating its jubilee this year—50 years since pioneers including Abraham Maslow, Anthony Sutich, and Stan Grof inaugurated this sub-discipline of psychology. Much has changed over this half century, and the challenges we face in moving transpersonal psychology forward now are significantly different to those in what may be termed the first phase of the movement. In particular, the anathema with which psychology viewed research into consciousness, spirituality or mysticism has largely evaporated. In many ways, the goal of the pioneers—that academic psychology would open its eyes to the “further reaches of human experience”—has been achieved. The future of transpersonal psychology depends on recognising and responding to new challenges that emerge within the multifaceted, global contexts of the 21st century, as we increasingly recognise not only our need to evolve as individuals but as an interconnected whole, encompassing the wider world beyond the human sphere. Transpersonal psychology can contribute to the continued evolution of our consciousness and culture, for example, by establishing explanatory frameworks that are post-material; honouring the role of the sacred in research; building effective educational programmes that are transformative, nourish the soul-dimension, and instil sound skills of scholarship and research. 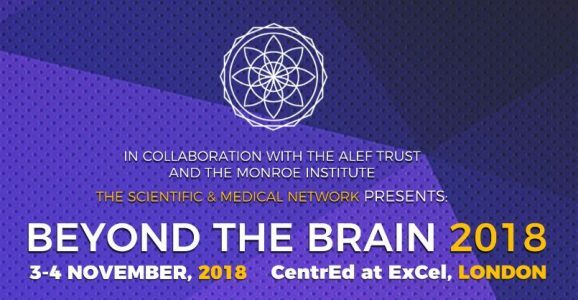 Over some seven years, the Scientific & Medical Network has built a partnership with the Alef Trust, a non-profit company whose mission addresses such challenges, focusing primarily on education. In this session, Les Lancaster, and Jessica Bockler, Founding Directors of the Alef Trust, will convey the Trust’s vision and explore how it contributes to the second phase of transpersonal psychology. Les and Jessica will be joined by MSc students of the Alef Trust who will share their experience of transformative education and the directions in which their own research is leading. An interpretive phenomenological analysis of the transformative potential of Nia, a contemporary dance practice which has influences from healing and martial arts traditions. A few years ago, a client of mine (who was in therapy with me at the time) phoned me in distress. She explained that she had had an alarming experience, where she had left her body, and in her words, “gone to the other side”. Unknown to my client, I had held an interest in near-death and out-of-body experiences for some years, and once all ethical considerations had been addressed, we explored her experience. It was at that point I started to question what the client’s therapeutic experience would have been had I not have had a transpersonal orientated therapy practice. The aim of this paper is to consider to what extent a transpersonal orientation is necessary in therapy for conscious development. Consideration will first be given to definitions of ‘transpersonal orientation’ and ‘conscious development’, followed by arguments for and against traditional behaviourist, psychodynamic and transpersonal approaches with a view to address the assignment question. Before concluding, consideration will also be given to the importance of scientific world view and how it impacts the term ‘conscious development’. 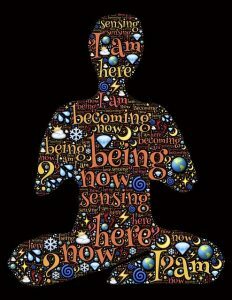 The word transpersonal literally means: beyond (or through) the personal. It refers to experiences, processes or events in which our normal limiting sense of self is transcended and in which there is a feeling of connection to a larger, more meaningful reality. For many people, religious or spiritual experience is seen as central to the transpersonal agenda, although the transpersonal can also be about extending concern for (or our sense of identification with) other people, human kind in general, life, the planet or nature (Daniels, 2005, p.11). Regarding the term, ‘conscious development’, Barrett (2016) outlines seven stages of psychological development, which have been built upon Maslow’s hierarchy of needs. These stages include: surviving, conforming, differentiating, individuating, self-actualizing, integrating and serving. In personal opinion, these stages encapsulate a spectrum of ‘conscious development’, and hence represent an adequate definition for the term. The middle of the twentieth century saw psychology dominated by two major schools, behaviourism and Freudian Psychology (Grof, n.d.). Both Pavlov’s notion of classical conditioning (Pavlov, 1927), and Skinner’s concept of operant conditioning (Skinner, 1953) have provided blueprints for evidence based applications in behaviourism. Behaviourism has since proven effective in therapeutic setting; for example, in the diagnosis of patients with mental disorders by operationalizing the acquisition of new behaviour (Barrett & Lindsley, 1962), and in improving item-recall in dementia patients (Dixon et al., 2011). In clinical psychology behaviourists theory is typically complimented with cognitive theory to produce more effective results (Feltham & Horton, 2006); for example, cognitive behaviour therapy has been shown to be particularly effective for the treatment of post-traumatic stress disorder (PTSD) (Schnurr, 2007). Additionally, a review of 16 meta-analyses supported the efficacy of CBT in many disorders (Butler et al., 2006). 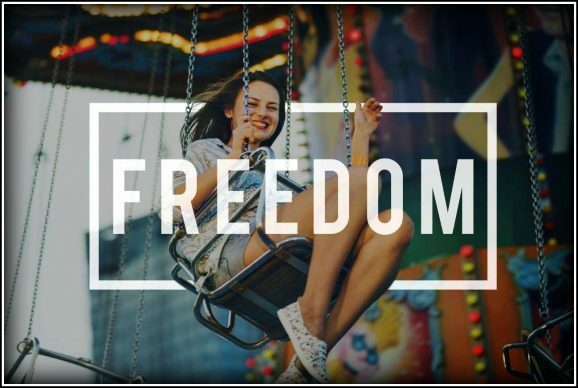 Freudian psychology, which has given rise to the psychodynamic approach has also shown benefits in a therapeutic setting. For example, Shedler (2011) highlights that empirical evidence does support the efficacy of psychodynamic psychotherapy, with patients continuing to improve after therapy ends. Additionally, there is also evidence that long-term psychodynamic psychotherapy is an effective treatment for complex mental disorders (Leichsenring & Rabung, 2008). Although contemporary psychological and behaviour approaches have undergone considerable change and have clearly made a valuable contribution to therapy, Cortright (1997) points out that, “all genius is a product of its time” (p.34), meaning that the scientific outlook (Newtonian-Cartesian worldview) of the early 1900s is embedded in both Freud’s psychology and behaviourist approaches. This, in personal opinion, is an important consideration, and will be addressed later on. Despite success such as that outlined above, both behaviour and psychodynamic approaches drew criticism in the 1950s and 1960s. Humanistic psychology was developed as a result of a dissatisfaction with the two major schools of psychology, which were considered to be increasingly inadequate approaches to the human psyche (Buskist et al., 2010; Grof, n.d). The primary objection against behaviourism was that the study of animals could only help with aspects of human functioning which were shared with these animals, and hence could offer no relevance in understanding higher human functions, such as love and morality (Grof, n.d.). It was also argued that human nature extends beyond environmental influences, and that Freudian psychology was preoccupied with psychopathology, ignoring positive phenomena such as happiness and satisfaction. Humanistic psychology therefore was an approach that studied human behaviour, placing emphasis on human experience, choice, creativity, self-realization and positive growth (Buskist et al., 2010). Despite humanistic psychology becoming increasingly popular, its founders Maslow and Sutich became dissatisfied with the original conceptual framework, feeling that they had left out the spiritual dimension of the psyche (Sutich, 1976). The widespread psychedelic experimentation during the 1960s, along with a growing interest in Eastern spiritual philosophies, meditation and various mystical traditions called for a more cross-cultural, comprehensive psychology, which led to the formation of “transpersonal psychology” in 1976 (Grof, n.d). Cortright (1997) has commented that it is difficult to understand how psychology, which has tried to explore the truth of human experience could have avoided the realm of spirituality so long, especially because it has been an aspect of human culture throughout history. There have since been a number of contributors to the field of transpersonal psychology, for example, Wilber. Although not a clinician, Wilber has made a significant contribution incorporating transpersonal stages of development derived from non-western traditions along with the western human stages of development (Wilber et al. 1986). The emergence of humanistic and transpersonal psychology resulted in new effective therapeutic approaches which dealt with the whole person, and also placed emphasis on the interconnectedness of body and psyche (Grof, n.d.). Jung was arguably the first clinician to legitimise a spiritual approach to depth psychology, and suggested that psychological development should not stop at adult ego maturation, but rather should extend to include higher states of consciousness (Kasprow &Scotton, 1999). Additionally, the founder of pychosynthesis, Assagioli has argued that Freud did not give adequate consideration to the higher aspects of human personality, consequently recognising the need for a broader idea of the human being. Psychosynthesis therefore works to integrate both the higher and lower levels of the unconscious. It has also been stipulated that as we progress in life our sense of world meaning also grows, eventually leading us to a transpersonal dimension of growth (Firman &Vargiu, 1996). Similarly, Hillman has argued that old psychology no longer works, and that too many people have been analysing their pasts and childhoods, recognising that it does not do enough (London, 1998). Hillman instead suggests that there is an individual soul, which is responsible for individual character, aspiration and achievement (Hillman, 1996). In terms of research showing a connection between transpersonal elements and healing, Schwarz (2002) has found that when experiencing trauma, the experience of being connected to God is a powerful resource that has the ability to calm and regulate the affect. Koenig (2010) has reported that recent studies have found that spirituality may serve as a spiritual and social resource for coping with stress; and Goldman (2012) has found that there is a strong case for using meditation as a primary strategy in improving mental health. Some disadvantages of a transpersonal orientation however, have also been highlighted. Wellwood (2016), for example, refers to ‘spiritual bypassing’, where spirituality is used to try and rise above a shaky foundation, therefore becoming another way of rejecting one’s experience. Additionally, Ajaya (n.d) highlights that spirituality is interested in that which transcends the complexities of a person, and consequently produces people who may have mastered a particular realm, but yet still struggle with psychological conflict. As a transpersonally orientated psychotherapist, I too discovered early on in my practice that whist the transpersonal practices were highly relevant, there were clients that required more skill to be worked with. Hence, there came a point where I felt that I had to expand my skillset to understand more about how trauma effects the brain, essentially engaging in a Newtonain based science, and building upon my transpersonal orientation. Although referring to psychiatry, Kasprow & Scotton (1999) express my realization well, stating that, “the current ‘classical’ psychiatry is a subset of a larger system, the new transpersonal psychiatry” (p.12). I personally view a transpersonal orientation as an inclusive practice, building upon traditional western psychology. So far, this paper has presented some evidence for and against both traditional and transpersonal approaches, highlighting that both approaches have a part to play in conscious development. From a personal perspective however, a key factor in ascertaining to what extent a transpersonal orientation is necessary for conscious development, is the way in which we personally define the term “conscious development”; which is ultimately dependent on our basic assumptions of reality. Cortright (1997) highlights that the level of theory includes philosophical worldviews and basic assumptions about human nature. Therefore, we must consider how scientific worldview has changed and whether it has informed our basic assumptions about human nature. By the late 19th century, physicists were certain about their ideas about the nature of matter, with Newtonian physics being regarded as an absolute certainty. (McEnvoy &Zarate, 1996). The advances in Newtonian science encouraged psychologists to look for mental elements that combined to create complex experiences. (Atkinson, 2000). In other words, consciousness was considered an epiphenomenon of the brain (Goswami & Pattani, in prep). Additionally, behaviourism was also rooted in Newtonian physics (Atkinson, 2000). This started to change in the early part of the 20th century as quantum physics started to emerge, presenting a new theoretical framework at a subatomic level, questioning our previous assumptions about the nature of reality (Goswami, 1993). Not only has there been a new science emerging, but there have also been other findings in parapsychology, such as: veridical studies in near-death experiences, suggesting that some part of us moves on after physical death (Rivas et al., 2016); biocommunication with plants, which suggests that there is a universal interconnectedness (Backster, 2003); non-local communication in correlated brains, suggesting that if we meditate upon the intention, we can communicate with one another instantaneously (Grinberg-Zylberbaum et al., 1994); and the effects of remote prayer on bloodstream infection (Leibovici, 2001). All these findings suggest that quantum concepts such as non-locality are at play, and that perhaps consciousness is the ground of all being (Goswami & Pattani, in prep). I believe that the more a person’s world-view begins to change, whether that be through, for example, new scientific discoveries, or through personal experiences such as that of my client at the beginning of the essay, a transpersonal orientation becomes essential for conscious development. Cortright (1997) states that “regular people with ordinary problems who are also on a spiritual path are seeking psychotherapy from transpersonally orientated practitioners” (p.13). This illustrates that a person’s notion of conscious development, and what they feel they require changes when their worldview includes a transpersonal element. Boorstein (1997) also comments on this from a therapeutic perspective, highlighting that he went from being a traditional psychotherapist therapist to a transpersonally orientated psychotherapist over a period of several years, during which time his world-view and values changed. This does not however mean that a transpersonal orientation is necessary for conscious development all the time. The first three stages of Barrett’s seven stages of psychological development are centred around survival and safety, and apply to infant, child and teenage development. If however, the first three stages are not mastered, one’s ability to master the later stages, (in which “soul motivations” are considered), is significantly affected (Barrett, 2016), and cases of developmental trauma may lead to mental health issues (Linehan, 2015). Working with individuals within these first three levels may not always require a transpersonal consideration. For example, the studies presented in the earlier part of this assignment highlighted how behaviour and psychodynamic approaches have been successful in treating some issues, indicating that a transpersonal approach is not necessary for conscious development. I have also worked with clients who are not open to a transpersonal orientation and yet we have made some good progress. In personal opinion however, I do feel that conscious development is limited without a transpersonal orientation, but this is a reflection of my own assumptions about reality. At the beginning of this paper I presented a definition of transpersonal orientation from Daniels (2005). However, during the process of this writing, I realised that a transpersonal orientation is not just about the practice (for example, tools and techniques, or including a spiritual aspect in therapy), or the client’s beliefs; but is also about the therapist and how a therapist holds space. (Cortright, 1997) expresses this well: “transpersonal therapy lies not in what the therapist says or does, but in the silent frame that operates behind the therapist’s actions, informing and giving meaning to specific interventions (p.15).” Additionally, Goswami suggests that being in the presence of an individual who is consciously evolved, (such as a Maharishi), in itself can create a healing (Goswami & Pattani, in prep). I have worked with many cases of severe trauma where I feel that I have not applied transpersonal tools, yet I have become very aware that as a therapist, I am still transpersoanlly orientated through my presence. The question for me to consider then becomes, ‘what role is my transpersonal orientation playing in the background, and is it contributing to conscious development in any way?’ Additionally, I would be interested to explore whether or what role the therapist’s own belief has played in some of the behaviour and psychodynamic studies mentioned earlier. In conclusion, the extent to which a transpersonal orientation is necessary for conscious development, has not been an easy question to answer. The main challenge being a lack of a standardised definition for both transpersonal orientation and conscious development. Also, consideration needs to be given to how a transpersonal orientation manifests. For example, there are tools and techniques, such as meditation, which may be considered as transpersonally orientated; but there is also the presence of the therapist that plays a part too. In light of the evidence presented however, a transpersonal orientation is not always necessary for conscious development. This has been illustrated by the studies showing success with behaviour and psychodynamic approaches. However, I do feel that traditional western approaches cannot deal with the deeper questions about reality that one may have. A transpersonal orientation becomes essential, in my opinion, if an individual’s concept of conscious development includes transpersonal elements. Additionally, a transpersonal orientation may also be useful in cases where a client experiences phenomenon that cannot be explained or addressed by a classical reductionist worldview, rather like the example I shared at the start of this assignment. It should be noted however, that a transpersonal orientation in therapy needs to be considered carefully, being aware of manifestations such as spiritual bypassing. Finally, I suspect that a transpersonal orientation will become increasingly necessary as the modern science ushers in a new paradigm. A Transpersonal Orientation: Psychosynthesis in the Counselor’s Ofiice. (n.d). https://www.psychologytoday.com/sites/default/files/attachments/42788/transpersonal-orientation-didi.pdf. Retrieved 20th June 2017. Ajaya, A. (n.d.) Psychotherapy and Self-Revelation PhD. https://education.pdf.net/access/content/group/CSTP4019TherapyAll13/Resources%20for%20forum%202/Therapy%20and%20therapist/psychotherapy%20and%20self%20revelation%20submitted%20article.pdf. Retrieved 21 June 2017. Atkinson. R.L., Atkinson, R.C., Smith, E.E., Bem, D.J. & Noel-Hoeksema, S. (2000) Hilgard’s Introduction to Psychology: Thirteenth Edition. London: Harcourt College Publishers. Atmanspacher, H. (2015) “Quantum Approaches to Consciousness”, The Stanford Encyclopedia of Philosophy (Summer 2015 Edition), Edward N. Zalta (ed. ), Retrieved from <https://plato.stanford.edu/archives/sum2015/entries/qt-consciousness/>. Backster, C. (2003) Primary Perception: Biocommunication with Plants, Living Foods and Human Cells. California: White Rose Millennium Press. Barrett, R. (2016) A New Psychology of Human Well-Being: An Exploration of the Influence of Ego-soul Dynamics on Mental and Physical Health. UK: Fulfilling Books. Barrett, B. H., & Lindsley, O. R. (1962) Deficits in Acquisition of Operant Discrimination and Differentiation Shown by Institutionalized Retarded Children. American Journal of Mental Deficiency, 67, 424-435. Beck, A.T., Butler, A.C., Chapman, J.E., Forman, E.M. (2006) The Empirical Status of Cognitive Behavioral Therapy: A Review of Meta-analyses. Clinical Psychology Review. 26 (1), pp.17-31. Bernardy, N., Chow, B.K., Engel, C.C., Foa, E.B., Friedman, M.J., Haug, R., Orsillo, S.M., Resick, P.A., Schurr, P.P., Shea, M.T., Thurston, V. & Turner, C. (2007) Cognitive Behavioral Therapy for Posttraumatic Stress Disorder in Women: A Randomized Controlled Trial. JAMA, 297(8): 820-830. doi:10.1001/jama.297.8.820. Boorstein, S. (1997) Clinical Studies in Transpersonal Psychotherapy. New York: State University of New York Press. Buskist, W., Carlson, N.R. & Martin, G.N. (2010) Psychology. UK: Pearson Education Limited. Cortright, B (1997) Psychotherapy and Spirit: Theory and Practice in Transpersonal Psychotherapy. New York: State University of New York Press. Daniels, M. (2005) Shadow, Self, Spirit: Essays in Transpersonal Psychology. UK: Imprint Academic. Dixon, M., Baker, J. C., & Sadowski, K. (2011) Applying Skinner’s Analysis of Verbal Behavior to Persons with Dementia. Behavior Therapy, 42(1), 120-126. Feltham, C., & Horton, I. (2006) The SAGE handbook of counselling and psychotherapy. London: SAGE. Firman, J. & Vargiu, J. (1996) Personal and Transpersonal Growth: The Perspective of Psychosynthesis. In Boorstein, S. (ed) Transpersonal Psychotherapy: Second Edition New York: State University of New York Press. Goldman, M. (2012) Meditation = Better mental Health. The Australian journal of Pharmacy. 93(1106). wpcontent/uploads/pdf/A_Brief_History_of_Transpersonal_Psychology_Grof.pdf. Retrieved 20th June 2017. Goswami, A. (1993) The Self-Aware Universe. New York: Putnam Books. Goswami, A. (2012) God is Not Dead. USA: Hampton Roads Publishing. Goswami, A. & Pattani S. (in prep.) The Quantum Science of Happiness. Grinberg-Zylberbaum, J., Delaflor, M., Attie, L. & Goswami, A. (1994) Einstein Podolsky Rosen Paradox in the Human Brain: The Transferred Potential. Physics Essays Volume 7, pp.422-428. Hillman, J. (1996) The Soul’s Code: in Search of Character and Calling. New York: Warner Books. Kasprow, M.C. & Scotton, B.W. (1999) A Review of Transpersoanl Theory and its Application to the Practice of Psychotherapy. Journal of Psychotherapy Practice and Research. 8(1), pp.12-23. Koenig, H.G. (2010) Spirituality and Mental Health. International Journal of Applied Analytic Studies. 7 pp. 116-122. Leibovici, L. (2001) Effects of Remote, Retroactive, Intercessory Prayer on Outcomes with Patients with Bloodstream Infection: Randomized Control Trial. British Medical Journal 323, pp.22-29. Leichsenring, F. & Rabung, S. (2008) Effectiveness of Long-Term Psychodynamic Psychotherapy: A Meta-Analysis. Jama. 300(13):1551:1565. doi:10.1001/jama.300.13.1551. Linehan, M. (2015) DBT Skills Training Manual. New York: Guildford Publications. London, S. (1998) On Soul, Character and Calling: A Conversation with James Hillman. http://www.scottlondon.com/interviews/hillman.html. Retrieved on 2nd July 2017. Pavlov, I. P. (1927) Conditioned Reflexes: An Investigation of the Physiological Activity of the Cerebral Cortex. Translated and Edited by G. V. Anrep. London: Oxford University Press. Schwarz, R. (2002) Tools for Trauma. New York: Routledge. Shedler, J. (2011) The Efficacy of Psychodynamic Psychotherapy. Psychodynamic Psychotherapy Research. Pp.9-25. Skinner, B. F. (1953) Science and Human Behavior. New York: Macmillan. Sutich, A. (1976) The Emergence of the Transpersonal Orientation: A Personal Account. Journal of Transpersonal Psychology. 8, 5-19. Wellwood, J. (2016) Embodying Your Relization – Psychological Work in Service of Spiritual Development. Journal of Consciousness Studies. 23(1-2) pp.69-79. Wilber, K., Engler, J. & Brown, D. (eds.) (1986) Transformations of Consciousness. Boston: Shambala. Sunita is a psychotherapist and researcher based in London. 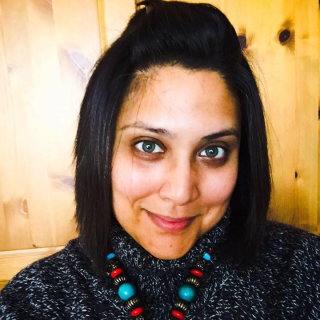 She is particularly interested in how the quantum world-view informs psychotherapeutic practice, and currently specializes in using energy psychology to treat psychological trauma. Sunita is also conducting research in energy psychology. You can learn more about Sunita at www.sunitapattani.com. In our increasingly complex and interconnected world, a growing global community of transpersonal activists feels that access to practices and therapies which support transpersonal states should be recognized as a basic human right. The term “transpersonal” may not be familiar to everyone (yet) but what it means is something pretty simple and familiar to most. “Trans” means “through” or “beyond” and so transpersonal implies experiencing and understanding life, the world and cosmos through or beyond the limits of personal identity or self, or, beyond the ego. People may experience the transpersonal as a result of dedicated contemplative practice (for example, meditation and mindfulness) and participation in spiritual/religious ritual, intentionally engaging in compassion/altruism, learning how to have out of body experiences, or by spontaneously experiencing peak or mystical states. Since these states of expanded consciousness and self are so common, we believe they hold great promise for improved individual well-being, spiritual growth and social harmony. Do you have the passion of an activist? Do you believe in the fundamental right of all people to be able to access and engage in consciousness expanding practices for medicinal, therapeutic, spiritual and social purposes? Are you interested in participating in a project to promote transpersonal rights? Then you might be interested an activist project to promote transpersonal rights. Dr. Regina Hess is leading a project with the European Transpersonal Association (EUROTAS) to advocate for the right to engage in transpersonal practices to be recognized internationally as a human right. This right would include the right to practice and participate in indigenous spiritual traditions, world religions, shamanism, and non-denominational movements. 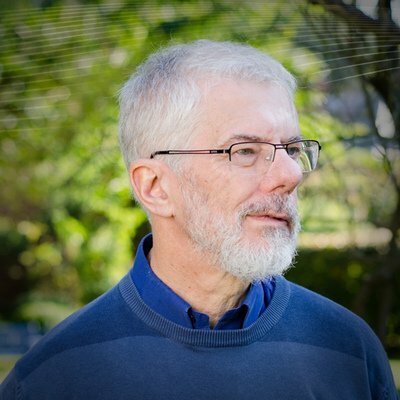 Dr. Hess is looking for enthusiastic transpersonal researchers, practitioners, and leaders, to co-participate in defining the vision, aims, strategy and content for this initiative. A proposal will be presented at EUROTAS’ XIX European Transpersonal Conference in St. Petersburg in September 2018. If you are interested in participating, please contact Dr. Hess directly with the first contact form below. Alternatively, there will be a call to discuss the project further on Monday 14 May. If you’d like to join the call, please email Lorraine Clewer through the second contact form below. For 25 years Dr Olga Louchakova-Schwartz taught at the Institute of Transpersonal Psychology. She started at ITP in 1992, as adjunct research professor, and worked her way up to being Founding Director of Transpersonal Education and Research Specialization (2004-2014), of the World Wide Learning Exchange Program (2007 -2013), and of the pioneering Neurophenomenology Centre, the first of its kind (2007 – 2015). She is now Professor Emerita of Psychology and Comparative Religion. 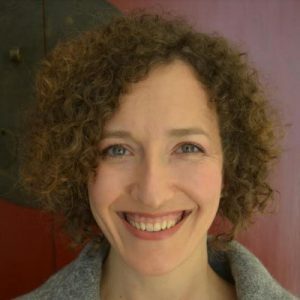 Dr Louchakova-Schwartz has authored more than 150 papers and book chapters in various areas of neuroscience, philosophy, and transpersonal psychology. She is editor-in chief of the upcoming book, “A Problem of Religious Experience: Case Studies in Phenomenology “, which will be be published by Springer in 2018. Her collaborative research (with Maria Kozhevnikov, Zoran Josipovic, and Michael Motes) in the cognitive psychology of Tibetan meditation was featured on the BBC, Science Daily, and other important forums. She is a Founding Director of the Society for the Phenomenology of Religious Experience and has many more strings to her bow. Francesca Hector caught up with Dr. Olga Louchakova-Schwartz in December at her Berkeley home in the Bay Area to twang a few, from transformative practices and academic insights, to useful tips for students and unexpected encounters with harbour seals in the Pacific Ocean. Olga, thank you for making time in your busy schedule for this conversation. Could you start by giving us a brief outline of your academic background? I was trained as a medical doctor, a paediatrician and a neuroimmunuologist, and afterwards did my PhD in neuroscience, at the Pavlov Institute and the Institute of Experimental Medicine in Russia. My research was the area of autoimmune diseases of the nervous system. Then, I became specialised in psychotherapy and psychological assessment, studied comparative religion and spirituality, and after doing many psychospiritual trainings (e.g. breathwork, various kinds of meditation, Chi Gong, Kundalini Yoga etc.) I ended up teaching transpersonal psychology. I’ve also done a lot of independent studies with three leading phenomenologists, Amedeo and Barbro Giorgi and philosopher Anna-Teresa Tymieniecka. I studied with several great teachers of Vedanta, Sufi scholars, and Hesychast (Christian mysticism). I became very interested in comparative religion and investigated it in depth, mainly through field research and with every traditional teacher I could get close to. Was there a defining moment in your early studies and experiences which made you identify more closely with transpersonal psychology rather than other branches of psychology? Yes, transpersonal psychology became very important for me in the late 1980s and 1990s, especially when I connected with underground spiritual groups in then atheistic Eastern Europe. My main focus was always psycho-somatic, so I had a lot of interesting experiences like yoga tummo – opening the inner heat of the body in very cold water, channelling, psychic viewing, meditative experiences, and of course various altered states of consciousness. I couldn’t find any explanations for these phenomena in academic psychology, medicine, or science. Around 1987, two psychedelic researchers, Evgeni Krupitski and Igor Kungurtsev, asked to use meditation groups I taught as controls in a clinical ketamine trial. Through these two researchers, and Toni Soidla, I learned about transpersonal psychology. The first book I read in transpersonal psychology was Wilber’s Spectrum of Consciousness. I was extremely excited, as if a light bulb switched on in my head. “Oh my God there’s a kind of psychology that takes these phenomena seriously and can conduct research in this area,” I thought. It was an exciting time! As you know, by that time transpersonal psychology broke through the red tape and became a part of mainstream “academic” psychology. Now, the cat is out of the bag, spirituality is acknowledged as a discipline in its own right, and also a part of medicine, business etc, and everybody is researching it. But back then, such possibility was quite exceptional. Was there a specific practice or tradition that impacted you especially strongly? Absolutely. Well, there are three, really. Kundalini Yoga/Buddhist Tantric practices, Christian Prayer of the Heart tradition, and Advaita Vedanta. There were nearly ten years in my life when I closely followed Sufism; I liked Gurdjieff’s studies a lot. And of course, inescapable Vipassana. I took time out of academia and worked as a spiritual teacher, using all these beautiful practices in an integral approach which I called Hridayam (“I am the Heart” Yoga). I was very interested in spiritual awakening, peak states, and human development, and studied with some remarkable masters who really made an impact on the consciousness of the 20th and 21st century. Is there anyone you would like to mention? I am very grateful to Harilal Sri Punjaji, and after his death, to Sri Ranjit Maharaj, a master from the Inch-giri lineage of Shakta Vedanta. Another very special master was Swami Dayananda Saraswati, a traditional teacher of Adi Shankara’s traditional Vedanta. But you know, sometimes a single encounter, a personal connection, or even an academic colleague can serve the same emancipatory purpose. For example, the historical and translational research of Zarathustra’s poetry by Martin Schwartz and the work of the Ibn-Arabi Society have had a profound effect on me. His Eminence Metropolitan Nikitas of the Patriarch Athenagoras Orthodox Institute in Berkeley, Lama Khenpo Paljor, and Sheikh Tayyar of Rifai Order in Istanbul are among my most respected teachers, but they themselves probably would not even know that. Did you notice a difference between the Kundalini Yoga as taught by Yogi Bhajan compared to the Kundalini Tantra of these teachers? The style I was taught by Vladimir Antonov opens very detailed awareness of internal spaces of consciousness. It has a strong component of mindfulness and attentiveness. It is also associated with the mastery of kundalini energy which can be invited into different passages of the subtle body in order to generate different states of consciousness, and eventually open the possibility of intentional transformation of one’s character. There’s a deep knowledge of chakras, meridians and centres which is very hands on and psychologically transformative. In contrast with this very intimate knowledge, I don’t know if Yogi Bhajan’s style unveils high levels of esoteric knowledge to everybody, and even what levels there are. I don’t know who the preceptors are in his lineage, and that’s important because there are different lineages of transmission. This intentional transformation sounds very interesting, and it ties in very much as an embodied resource through which you approach transpersonal studies on the academic side. Yes, that’s a good insight of yours, Francesca. Embodied spiritual practices go well with higher education because one of the outcomes is enhanced intellectual capacity. Not that people necessarily need it, but it’s a nice tool to have. These practices really liberate the mind, make it flexible, and remove random mental chatter. It’s also a wonderful tool for converting unwholesome emotions into wholesome ones. So does it make sense to say, based on what you’ve just shared, that a certain transformation of self, or a certain integration of aspects of self is necessary in order to address the transpersonal through academia? Oh, that’s such a difficult question! I think that personal experience is very important. This is simply because without personal experience, it’s hard to talk about human development as we see it in transpersonal psychology, that is with a reach of the ego beyond itself, and with the recognition of deep realms of human pure subjectivity and pure consciousness. Especially when one teaches. Sogyal Rinpoche, a very advanced lama from Nyingma Lineage once said, “It helps when one knows what one is teaching”. However, one should never underestimate the capacity of the human imagination and capacity for reflective insight. There are many colleagues of mine who have never done yoga or practiced any of those formal spiritual disciplines, and nevertheless they have a deep understanding of transpersonal states. Either they’re born with it, or it’s attainable through intellectual reflection somehow. I think it’s more important to have an ethical mind, a kind mind, and to be intellectually developed. The capacity to read and write is important, but in a sense the ethics, attitudes, cultivation of a good mind and capacity to make choices is perhaps even more important than having experienced these states. At the Institute of Transpersonal Psychology in the 1990s, we had a rule of hiring only faculty members who had some kind of internal practice and were personally familiar with those spiritual states. I think this is also important because this feeds into a world view, an empathic connection with other people and a more intimate understanding of the interconnectedness of the world. It’s good to have a direct intuition of that. Developing the theme of the transpersonal beyond spiritual and religious experiences, some of your work has focused on other territories such as migration and globalisation – how do these issues especially benefit from a transpersonal approach? There is a concept of chronic and multiple migrant stress. Even though migration is a natural behaviour of human beings and an essential part of human history, current migration is characterised by a number of features which were absent in historic migrations. For example, the fact that people lose connection with their loved ones, immediate family or tribes. Out of this rupture comes deep grieving. There’s also the problem of adapting to the new environment, different social typology, different social signals, emotions, and different ways in which social institutions work, and healing systems such as medicine or therapy operate. Besides, the hosting societies often do not have resources to help the migrants; all this, and other factors, contribute to extreme and chronic stress, with adverse health consequences. The statistics of mental health problems associated with migrants is not because migrants are bad people or something is initially wrong with their health. On the contrary, those who migrate are usually the stronger ones, the pioneers of their country. But the stress takes its toll. It leads to growing prevalence of mental health problems and physical problems such as diabetes, cardiovascular diseases, high risk of cancer and asocial behaviour. Migrant stress is an important factor in reformation of the self and changes in consciousness. I am very interested in the subject, especially so given the number of migrants in the world. I think the count was more than 260 million people in 2016. I don’t think migration can be artificially stopped, even if someone wants to build a wall or close borders. The world is different now, especially in Europe where there are such a large number of migrants. It’s a matter of helping migrants with assimilation, education, doing something with the situation which is already there. I think that transpersonal psychology must play a role in this because we do provide means of self-regulation and stress reduction. We know how to develop resilience, heal consciousness, and keep people healthy. In a sense transpersonal psychology is preventative personalised medicine. While we have different views on migration, and may love or not love transpersonal ethics, and principles such as non-violence, it’s absolutely clear that transpersonal practices reduce stress and bring out the best of resilience in people. That’s where I think we must step up to the plate. In which other directions would you like to see the academic hubs of transpersonal journals and conferences evolving, in terms of content, inclusion, or any other aspects? I think it’s important that there’s a study of human experience crossing over different disciplines. The study of subjectivity is missing in philosophy or science because we tend to study phenomena which can be reproduced, in large, statistically significant counts. Subjective processes are reproducible, but by means that are different from scientific observations and experimentation. So, reintegration of subjectivity in various areas of academic knowledge seems to me a matter of high importance, and I think that transpersonal psychology brings that dimension to its fullness, without chopping off religious and spiritual aspects of consciousness, and even make such aspects into very pragmatic kind of consciousness without mundanising them. Transpersonal psychology can dream. It has unbounded access to creativity. Could you give a specific example within the context of transpersonal education? What comes to mind is my work with our Alef Trust group right now. People come up with all kinds of interesting insights. The group is very alive. Everybody is passionate and connected with this growing age of consciousness, and interested in new knowledge. There can be a critical reflection, but this reflection is also vividly inspired. People reach out and want to connect with one another, they want to know. I teach in different environments and it often takes a lot of effort to wake up the group so that they become interested in the study beyond the level of skill, to bring out this creative, transformative component. It is much more present in transpersonal psychology and in the kind of people it attracts. Every time I read the group posts, there’s a live human connection, and it’s a creative connection. That’s very special, and I think it’s a repeated example. I’d like this to remain alive. I witnessed an opposite situation, even in transpersonal psychology. There can be a loss of connection with this transformative poetic energy of life, you could say “kundalini energy”, and it becomes a dry reflection, a kind of speculation and juggling mere ideas back and forth. That kind of turn is not interesting and not that useful, because philosophy or sciences are much more skilled in handling ideas. But transpersonal psychology fosters extraordinary personal creativity, and we have to keep this aspect alive. How does that switch from being alive to not being so alive occur? I don’t know how exactly, but I think it’s a community related process. Maybe what happens is that community leadership makes mistakes, in ethics, and in making their choices, and so the energies of the community stop flowing somehow. Then it becomes like a seed which lands on a rock and cannot really sprout. Ethical mistakes cut off the vibrancy of life. Exactly. William James said “where the energies flow”, that is, societal energies. It’s a metaphor, of course. But he had a very embodied and experiential understanding, so it’s half metaphor and half description. And as you say, these energies of life get diverted. Developing the conversation about energies going in a different direction, what feminine qualities would you like to see emerging beyond the masculine paradigm of academia, and how can we facilitate this? That’s interesting. I’ve taught and worked in different academic environments, and it happened that my bosses were always women. My first boss, the director of two labs I’ve worked in as a scientist, was a woman. My dissertation advisors were all women in high academic positions; the director of the Institute of Experimental Medicine where I had my defence was a woman; and right now I’m teaching at the Jesuit School of Theology where my Dean is a woman! I’ve had the great luck of working with many academics who were women, and on top of that, I had women teachers in my esoteric schools. Gender disparities exist, that’s a legacy of many centuries of cultural development, etc. But now, as women, we do have possibilities to write and to advance our careers in academia. Yes, it’s harder being a woman. The social gender disparities are real. But it also takes a lot to get rid of internalised disparity, that is, a cultural legacy of woman always being a helper. It’s a very strong “genetics”. I remember Maxim Gorky saying he squeezed a slave out of himself drop by drop; and evidently, he was a man. It is even more important being a woman. Another thing that we must develop in ourselves as women is social awareness. I don’t mean the social awareness of need, helping the poor or the disadvantaged, which has always been the task of women. We need to understanding how social systems work, the intricacies of social hierarchies, reading the styles and the types, developing the capacity to speak in different environments, rhetoric, making one’s point, keeping the focus on what is important to us, and not being afraid to acknowledge it on an authentic level, and have certainty and stability in case of adversity. It’s very personal. As a woman, it took me a while to squeeze the slave out of myself, drop by drop. But it’s possible now. Internal slavery is a cultural legacy, a remnant of patriarchy which is enforced by all the signals we receive day by day. It’s a day by day struggle, but in the current environment, it’s already possible to win the struggle. There are avenues where a woman in academia can succeed. Taking it on a case by case basis, establishing clear goals, working towards these goals, being patient with oneself, not in a hurry, and writing, writing, writing… and reading, reading, reading… this is the key. That’s very practical and sound advice! Do you have any other tips or suggestions for the students of transpersonal psychology who are enroled in your course now? My suggestion would be to study beyond transpersonal psychology, because transpersonal psychology doesn’t give explanations, on the contrary, it sets up puzzles. Which studies would you recommend? So many different things! I’d say medicine is very useful, it teaches you anatomy and the biological foundations of the human being. Philosophy too, such as phenomenology, analytic and continental philosophy, is extremely useful for transpersonal psychology. It helps to know a little of theology and understand how people conceive spiritual ideas in themselves. These would be the main three. All disciplines which explain the mind and human being in general outside transpersonal psychology are useful. Languages and history are very useful for transpersonal psychology as we (in transpersonal psychology) take many things for granted. We have a huge basket of phenomena in transpersonal psychology which need to be digested and researched, and we are like activists, record keepers on those phenomena, but we hardly have any means to understand them deeply, and for this I think we have to go out of the field. What are you reading and especially enjoying at the moment? Two wonderful books. One is written by the Norwegian philosopher Espen Dahl, called Phenomenology and the Holy after Husserl. Dahl bridges several phenomenological frameworks to see, explain, understand and describe how people come up with their ideas of the Holy. The second book, on religion and humour as emancipating provinces of meaning, is also a philosophical book, by Michael Barber, who will be a keynote at our Sophere Phenomenology Conference at the end of January. He studies social processes from the standpoint of the phenomenology of consciousness. Spirituality and religion are emancipatory provinces of meaning which advance us as human beings, and Barber studies this systematically and scientifically. One can have opinions about consciousness and the social world, or one can study them rigorously – so Barber is a rigorous researcher. They’re both “slow reading” books. I put them aside and then come back to them. It’s not a simple set of concepts. With Dahl it usually takes me three readings until I feel I’m getting it somewhat! It certainly sounds like you enjoy being challenged! Oh yes, it makes me feel more alive! Another thing I’m reading is a corpus of ancient poetry from around 1500 BCE. There was a poet priest called Zarathustra who was credited with starting Zoroastrianism, the most ancient extant religion in the world. He wrote 17 poems called the Gathas, in which he put forward what seems to be a very original concept of the deity, and a very interesting original concept of the human being. Schwartz’s translation really deciphers those compositions and it’s now possible to get an idea of what is really going on in Zarathustra’s poetry. The poet was very different from Nietzsche’s fictional character; real Zarathustra was very moral and even a self conscious person. I’m trying to tease out what’s going on with his spiritual experience, with all my transpersonal knowledge. With transpersonal psychology we become so flexible with our consciousness and get to know human experience so well that we can read ancient texts differently and notice things that others miss. For example, in old texts, human experience often loses its marker of being an experience. Coming from transpersonal psychology, it’s possible to reconstruct those dimensions of experience and embodiment. Yes. And there are other examples, like Patanjali’s yoga sutras, which everybody thinks is a description of experience. I don’t know, nobody has done an analysis of where those concepts could have come from. What else could they be if they’re not an account of experience? Do you mean metaphors for other worlds or subtle realms? They can be pure ideas; or, they can be poetic exercises, stylistic moments. Or, they can be experiences that happened to somebody else rather than the author. For example, it could have happened several centuries earlier in another location, and then become a story which was passed on orally. Then somebody recorded it, without even really understanding it. Oral cultures had an exceptional capacity for memorising things. Concepts were borrowed and plagiarism was completely ok in ancient times. I don’t think it’s possible to take it for granted that the exact author had that exact experience. An experience has structures, so what also happens is that if somebody doesn’t understand exactly what was going on they transmit it incorrectly, etc. On a personal level, have you found that your own understanding of the spiritual and mystical transpersonal experiences you’ve had has changed since the experience, and that you’d describe them differently now to how you would at the time? No, that’s an interesting observation, but I don’t think so, I find it stays pretty much the same. The freshness gets erased. However, I think it’s possible to discipline the mind so it doesn’t go into unbounded interpretations, even though I understand what you mean, that something you experienced in life acquires new meaning as you age. But I think certain structures of introspective experience, at least in my case, stay the same. What do you enjoy doing when you’re not studying and involved in academia? How do you like to relax? I love hiking and swimming in the ocean. My husband and I go north to Point Reyes National Park. The ocean is cold in winter, but I remember my yoga tummo days and dive right in. There are harbour seals, and seeing a nose of a seal sticking out of the water three yards away from me was a new experience! I used to be afraid of them, but now I can discern what they’re doing and whether I should get out of their way or not. Getting to know the animal world outside standard descriptions is absolutely marvellous! I also enjoy communicating with quails. They are very social birds, so if they’re in their native habitat they start communicating with you, showing off, trying to speak, and I can’t help wondering if this is something they picked up from all the people who visit, or if it’s a part of their social behaviour we know nothing about. Oh completely! Coyotes try to engage people; elk measure their movement against humans who are walking on the trail. I find it absolutely breathtaking. If it were possible I would have just lived there. It’s… I don’t know. That’s where I just don’t have the words. It’s not God but it’s something else. We live on an amazing planet which we share with so many other living being. Exactly. Science fiction is my other hobby. I am obsessed with Alastair Reynolds; I’ve just been re-reading Revelation Space. Reading and trying to interpret Zarathustra’s text is like communicating with the alien in Revelation Space! Have you ever tried writing science fiction or any other kinds of writing yourself? I wrote some poetry when I was younger, but no science fiction. I’m just consuming the knowledge of mythologised astrophysics which comes through these books! My task is more to write about human experience, to uncover the aspects of experience which bring out new philosophies and paradigms. I think phenomenology gives a language to transpersonal insight and makes it legitimate and understandable to others who might have not experienced it. I think it’s important to revitalise in this manner the areas of science where subjectivity is absent. It certainly sounds as if you are navigating an interesting path! Thank you Olga for sharing these insights with us, we look forward to continuing to learn with you during the transpersonal psychology course. 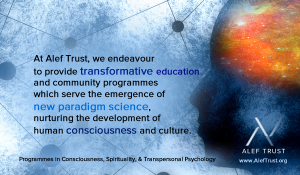 Along with our core PhD and Master’s programmes in Transpersonal Psychology starting in September each year, Alef Trust also offers 15 Open Learning Courses and 1 year Postgraduate Certificate/Diploma programmes starting in April!